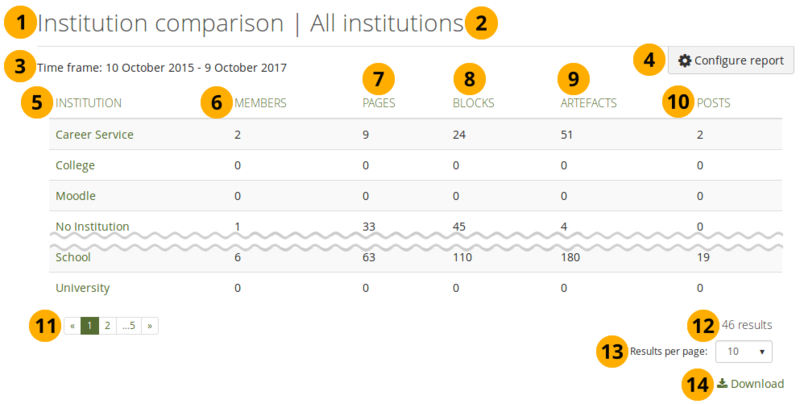 The Site statistics, Institution statistics, and User reports sections in the Administration area were combined in Mahara 17.10. Now they are all available from one central place. Further reports were added to expand the analytics capabilities. Institution that was selected for the report. If it says “All institutions”, then the report is over the entire site. 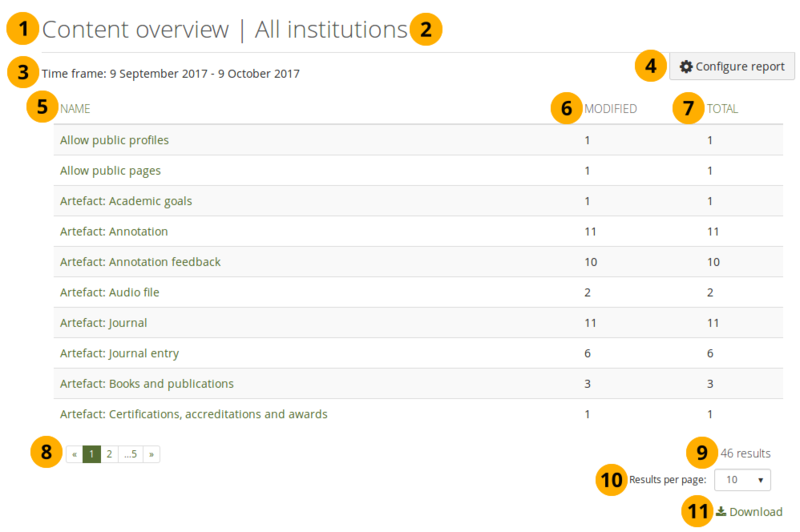 Site administrators see all institutions and the option “All institutions”, which is the site level. Institution administrators only see reports for the institutions in which they are an administrator. If you want to report over today in “To”, you need to choose tomorrow’s date as the date assumes the report is up to midnight of the previous day right before the start of today. 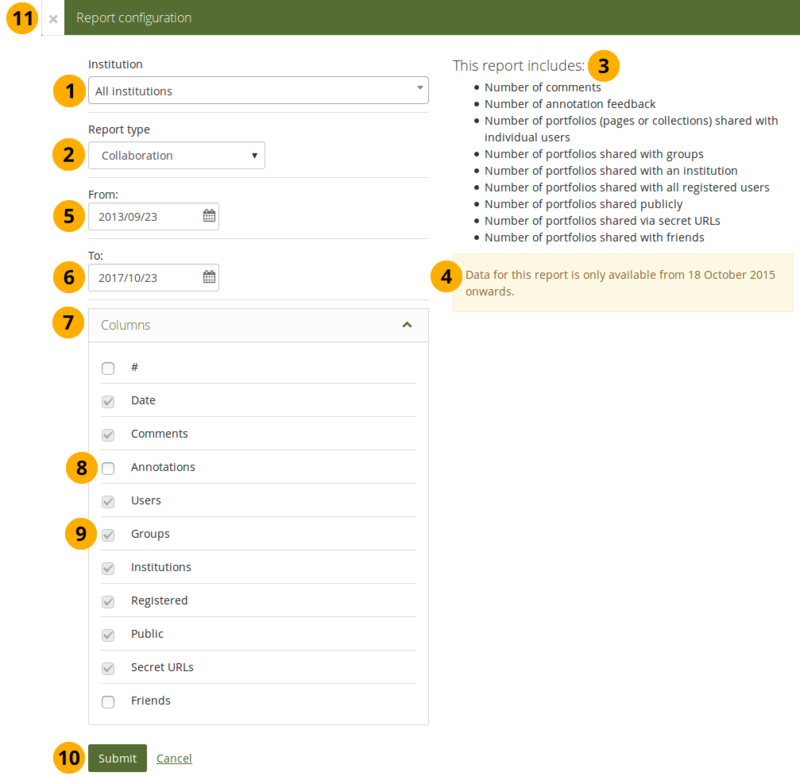 This report combines the pre-17.10 content and historical data statistics because the time frame can be chosen now via the time selectors in the report configuration. 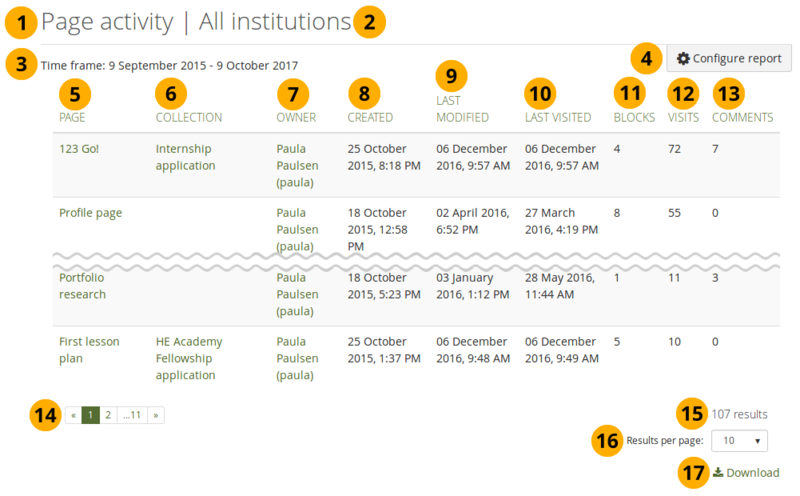 When you report over “All institutions”, you do not see blocktypes displayed. Currently, these are only available when you report over an institution. “N/A” (not available) in any of the columns indicates that there is no data available yet. This is an indicator that the information was not yet recorded via the event logging. 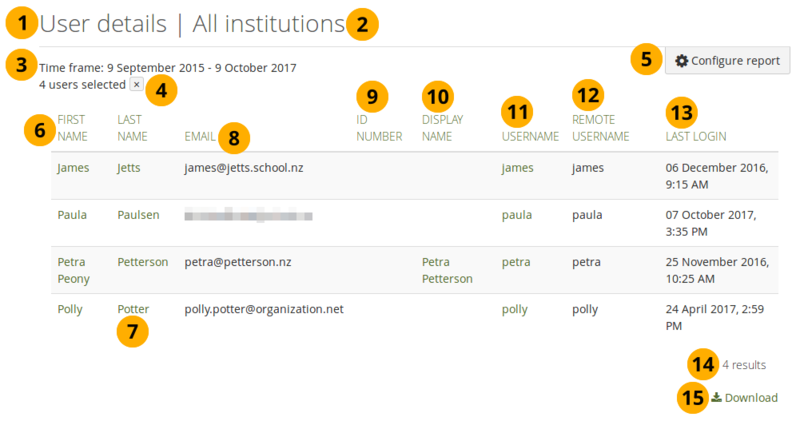 This report is only available on the site level when “All institutions” is chosen in the institution selector during the report configuration. Groups: Number of groups and average group membership of a user. This is only available for “All institutions”. Database size: Size of your database on the server. This is only available for “All institutions”. 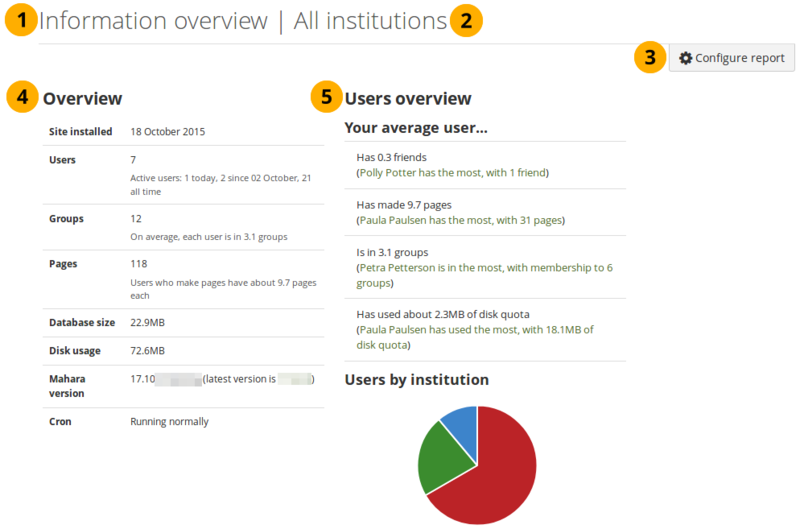 Mahara version: Version number of Mahara and the latest stable release. This is only available for “All institutions”. Cron: Information on whether cron is running or not. If it says “Cron is not running”, please check it. It may be running partially. This is only available for “All institutions”. Users by institution. This is only available for “All institutions”. 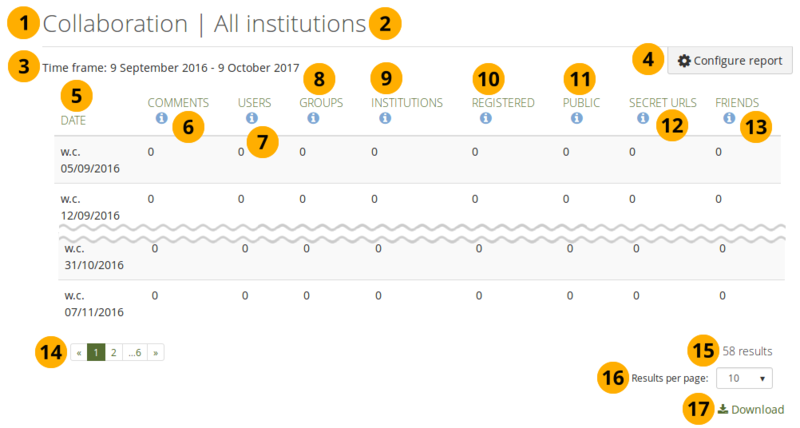 Groups overview: Number of groups by group type and access type. This is only available for “All institutions”. 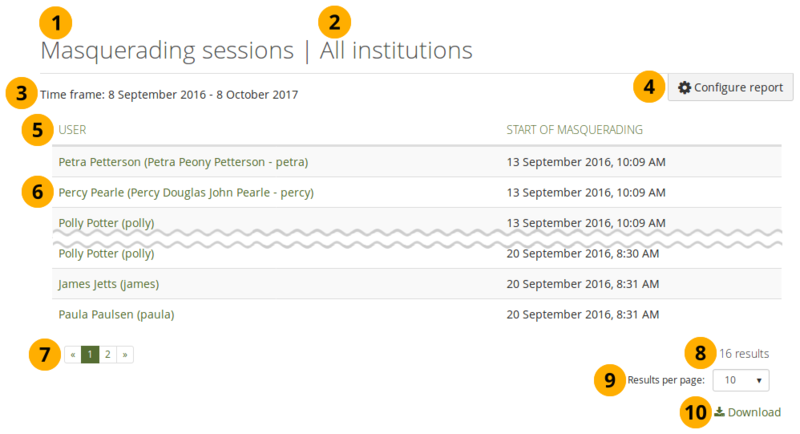 Report type: Select “Masquerading sessions”. Report type: Select “Portfolio access”. 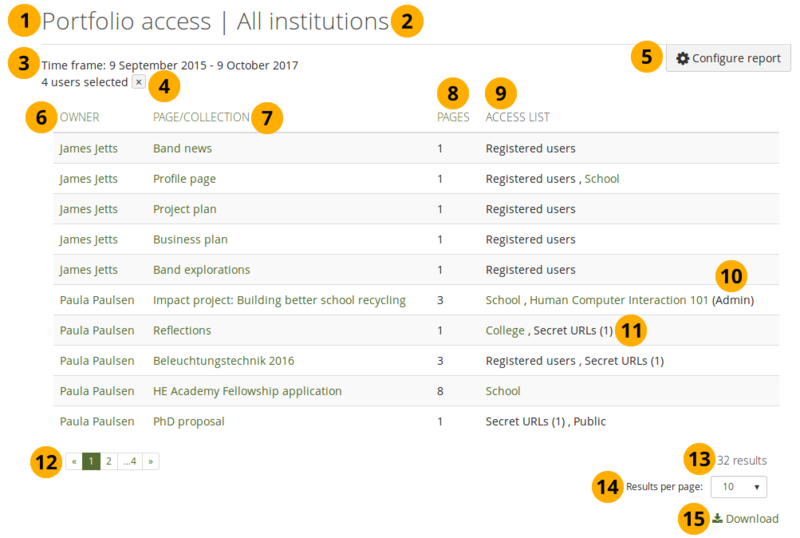 Though all pages, collections and groups are linked, you may not have direct access to them if you are not on the access list or a member of the group yourself. Report type: Select “User activity”. Report type: Select “User details”.